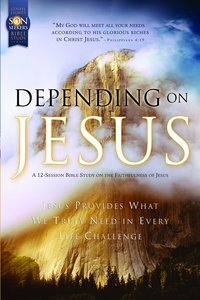 The Depending on Jesus Bible Study Guide will help adults dig into the Bible’s promises Jesus provides what we truly need for every challenge in life. Based on Philippians 4:19, “my God will meet all your needs according to his glorious riches in Christ Jesus” this study guide is not just about biblical facts and figures: it is about knowing, loving, and serving a great God. It is about God’s plan to bring people out of darkness and sin back into a relationship with Him through Jesus Christ. With this twelve week study, readers will learn to find true riches, true power, true love, true hope, and true peace in Jesus.